What is RESTYLANE and RESTYLANE SILK? The Restylane family of facial fillers are made of natural hyaluronic acid and used for instant correction of fine lines, facial wrinkles, lip enhancement and facial anatomical volume correction. Restylane and Restylane Silk are injected directly into the area that needs plumping, like the skin around your eyes, and where expression lines are formed like the lines about your mouth . What Is the Difference between RESTYLANE / RESTYLANE SILK /RESTLANE LYFT? There are several differences between fillers in terms of where it is placed and how long it will last. With 100’s of patients receiving fillers at Skin MD and Beyond, on a monthly basis, our doctors will help you decide the best choice for you. As the first hyaluronic acid wrinkle filler, Restylane has a well-known and well-deserved reputation as an instant facial filler that does not require sensitivity testing. Restylane is made by the same company that produces Restylane LYFT. Restylane and Restylane LYFT are identical formulations, but differ in gel particle sizes. Restylane LYFT, has a larger gel particle, and the ability to provide long lasting deep facial fold correction. Restylane Silk is the newest soft tissue filler FDA approved June 2014 for lip lines and lip injections. The difference between the two fillers Restylane and Restylane Silk is in the particle size; Restylane Silk is composed of very fine particles making it an ideal filler for areas with fine lines or areas that that need subtle filling. Believing that their patients deserve only the best, Drs. Wright give each person their undivided attention and performs all injectable treatments to ensure the most satisfying outcomes. With thousands of injections performed and years of experience treating a wide range of facial concerns associated with aging – their broad knowledge of different treatment options will give each patient the unique ability to consult with the doctor and help them select the perfect treatment option for them. How does RESTYLANE and RESTYLANE SILK differ from other Facial Fillers? Juvéderm has a higher concentration of hyaluronic acid and attracts more fluid, which makes it an ideal choice for volumizing lips but not for subtle lip contouring or for under eye correction. 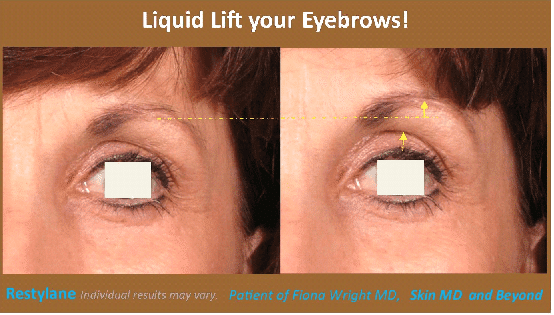 Restylane and Restylane Silk are best used for the tear troughs (area underneath the lower eyelids). Juvéderm is a little more expensive than Restylane, and a syringe of Juvéderm contains less product than Restylane (they contain 27% less filler than Restylane syringes), so Restylane may be preferred by some patients. Juvéderm tends to feel softer so it tends to provide a smoother result and not as likely to be lumpy. On the other hand, however, it doesn’t seem to provide the lift that Restylane provide. To achieve “full volume correction”, you need to replace enough of the lost volume to get a great result. So, for deeper wrinkles or to add volume Voluma, Radiesse, and Restylane LYFT are better products for volumization. How long does RESTYLANE / RESTYLANE SILK last? One of the great advantages of Restylane is that the effects are long lasting but not permanent. Duration depends on many factors, such as the individual’s skin type, lifestyle and age. After the initial treatment, follow-up sessions are normally recommended around every 6 to 12 months depending on the individual and the treatment. Some clinical studies have shown that if you are treated again at 4 1⁄2 to 9 months after your first treatment, Restylane can last up to 18 months in the nasolabial folds. In the lips, Restylane generally lasts six months. You can expect instant results upon injection. The doctors can see the correction changes evolve during your treatment. They will also give you a mirror so you can see the effects and add a little more filler if you would like. Our patents are thrilled with the immediate results and appreciate the ability to return to their busy schedule within the day. Like all fillers, Restylane typical has some mild swelling after injection particularly around the eyes and lips. This is due to the product absorbing water and from the “trauma” of the injection and it will usually take 2 weeks to completely settle down and provide you with the “final look”. Should you want additional treatments, it is recommended that you wait these two weeks before reinjecting. Is RESTYLANE fillers the same thing as BOTOX? Can people with different skin tones be treated with RESTYLANE fillers? Yes. The first exclusive study on the use of Restylane in patients of color was completed by Minneapolis dermatologist Charles Crutchfield MD. In his study he treated patients in various facial areas (acne scars, frown and marionette lines, nasal folds and lips. The patient were followed for 12 weeks and all patients reported that they had good to excellent results with no lasting results of scarring or skin discoloration. Does RESTYLANE / RESTYLANE SILK treatment hurt? Restylane is injected with an ultrafine needle and most people find the injections relatively painless. During the procedure topical anesthesia will be applied to the skin surface which will provide a very good initial numbing effect. The Restylane is also made with local anesthetic (lidocaine) in it – so the treatment area becomes number throughout the procedure – making the treatment well tolerated. Am I a candidate for treatment with RESTYLANE / RESTYLANE SILK ? What is RESTYLANE and RESTYLANE SILK commonly used for at Skin MD and Beyond?